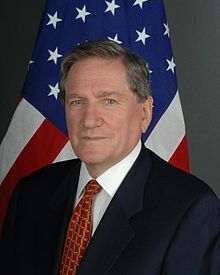 Richard Holbrooke was always one of my favorite Democrats–brilliant, dynamic, a fascinating personality, and a diplomat with actual, substantive accomplishments to his name (unlike a certain former secretary of state who is currently trying to convince us that she should be the next president of the United States). If life were fair, Holbrooke would have served as secretary of state in a Democratic administration (again, unlike a certain presidential candidate who actually did serve as secretary of state, despite the fact that she has no substantive accomplishments to her name), but alas, life is not fair.
. . . Mr. Holbrooke, who 15 years earlier had brokered the peace deal that ended the war in Bosnia, said he believed he could not get a hearing at the highest levels of the Obama administration. Of course, this is a one-sided account of Holbrooke’s treatment at the hands of the Obama White House, but it is quite well known that Holbrooke didn’t get along with the president and with most of the president’s team. Part of that may have been on Holbrooke; he was highly egotistical and pushy, and while that kind of behavior may work well with some, it won’t with others. But part of it is on the White House, which never went out of its way to make Holbrooke feel as though he had a place at the table. To the extent that Holbrooke was able to be influential in the Obama administration, that was due to his longtime friendship with Hillary Clinton, but Clinton could not make Holbrooke into a major player. And the argument that Holbrooke was essentially shunned and isolated within the administration gets more credence when one considers the fact that other outsiders were also not made to feel welcome by Team Obama. Robert Gates was the most powerful secretary of defense this country has had in decades, but he had to fight and scrap and claw for everything that he got from the Obama administration, and much of his standing and authority stemmed from the fact that he was seen as the savior of the American military effort in Iraq as a result of his service in the Bush administration. The Obama administration never took to Gates–as it never took to Holbrooke–and it was not sorry to see him leave. Gates wasn’t a huge fan of Team Obama, to be sure, but that doesn’t change the fact that Gates, for all his power, was very much an outsider looking in while he served as secretary of defense in the Obama administration. Before he was inaugurated, Barack Obama said that he wanted “a team of rivals,” in the mold of Abraham Lincoln’s administration. That was all very pretty talk, but when any actual rivals showed up to design and implement policy, the president and his team did their very best to send them to the back of the room. And in many cases, American foreign and national security policy suffered as a consequence.